In one of the closest-ever WRC rally finishes Sébastien Ogier and Julien Ingrassia won the Rally Sweden by 6 seconds from the Hyundai of Thierry Neuville/Nicolas Gilsoul (F/F, Hyundai). Volkswagen’s Mikkelsen/Ola Fløene (N/N) who had been leading at this morning’s re-start had to give way to this furious onslaught from behind but can comfort himself with a well deserved third place. The lead was changing hands regularly until the three protagonists went into the final showdown separated by just 4.6 seconds. Going into the closing Power Stage just 4.6 seconds covered the top three, but Mikkelsen had a wee slide and a spin and victory was gone in less than the blink of an eye. 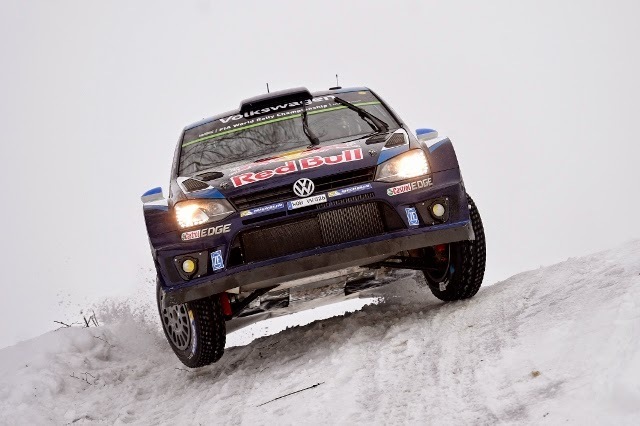 Ogier secured the stage win and pipped Neuville - surely the man of the rally. This was WRC victory number 26 for Ogier, who now equals Carlos Sainz’ record – next stop, Mexico.